DD Form 879 - also known as the "Statement Of Compliance" - is a Military form issued and used by the United States Department of Defense. The form - often incorrectly referred to as the DA form 879 - was last revised on April 1, 1998. Download an up-to-date fillable DD Form 879 down below in PDF-format or find it on the Department of Defense documentation website. PLEASE DO NOT RETURN YOUR COMPLETED FORM TO THE ABOVE ORGANIZATION. 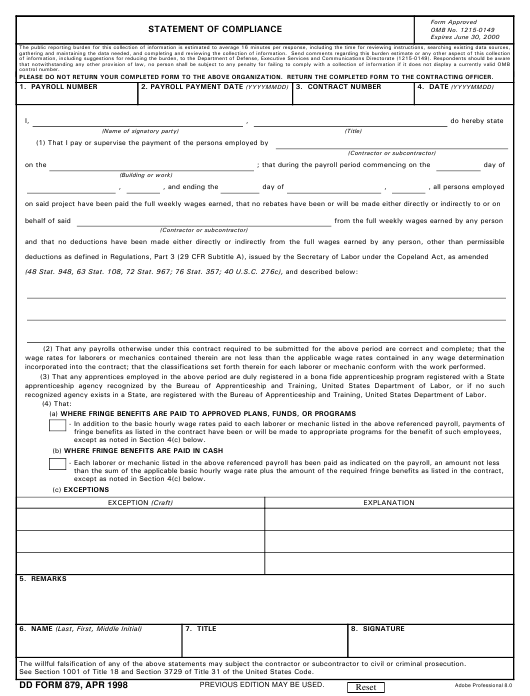 RETURN THE COMPLETED FORM TO THE CONTRACTING OFFICER. incorporated into the contract; that the classifications set forth therein for each laborer or mechanic conform with the work performed. recognized agency exists in a State, are registered with the Bureau of Apprenticeship and Training, United States Department of Labor. except as noted in Section 4(c) below. The willful falsification of any of the above statements may subject the contractor or subcontractor to civil or criminal prosecution. See Section 1001 of Title 18 and Section 3729 of Title 31 of the United States Code. employees as cash in lieu of fringes. exceptions shall be noted in Section 4(c). hourly rate and overtime rate paid to employees. funds, or programs as fringes.